I hate ‘why.’ I can’t wait until she grows out of the ‘why’ phase. It’s maddening. Random shots with my cheap-o cell phone camera. Both clickable. This is my attempt at conceptual art. 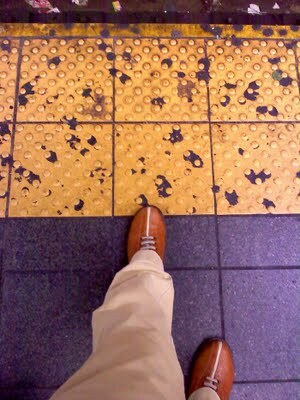 It’s called Pant Leg, Favorite Pair of Shoes, Subway Platform Edge. I know. You don’t have to say it. 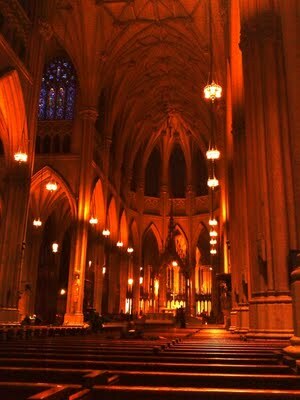 This is the interior of St. Patrick’s Cathedral on 5th Avenue next door to Saks Fifth Avenue with my cell camera set to “cloudy.” The temple of Catholicism next to the temple of consumerism. Are they really so far apart? “This is my attempt at conceptual art“you accomplished something remarkable. perhaps 4 square feet of a subway platform, with no visible “loogies”. nice. Kids! And their view on life, eh!Nice pic of St. Pat’s. Your camera phone has a ‘cloudy’ setting? God, are we in 1982 over here? *ignoring the consumerism comment*I’ve been in Saint Patrick’s Cathedral. I go and light candles everytime I’m in the area. Thanks for taking up the duty for me that one day! I kindly appreciate all the well wishes from your coast. The why is only annoying because you don’t really have an answer for it. If she were to ask why Bush was elected as a president the second time around, you’d probably have an answer for her.